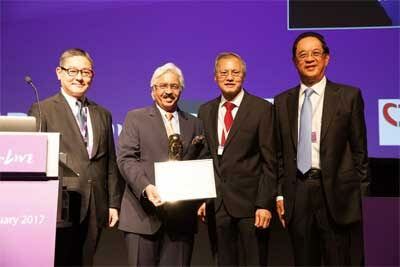 Dr Ashok Seth, Chairman, Fortis Escorts Heart Institute has been conferred with the prestigious “Life Time Achievement Award in Interventional Cardiology” by the Chien Foundation, Singapore at the premier annual meeting of Asian Pacific Interventional Cardiology – AsiaPCR SingLIVE 2017 in Singapore. 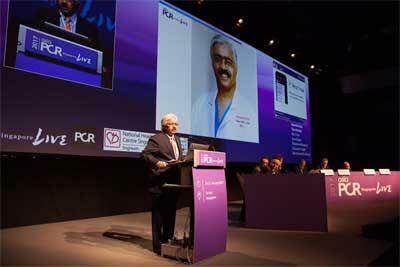 The meeting was attended by over 2000 interventional cardiologists from across the world. The Chien Foundation, Singapore is a 20-years old Scientific Foundation constituted by very senior Interventional Cardiologists of the Asia Pacific Region with an aim of training and research contributing to, and improving, the practice of cardiovascular medicine in the Asia-Pacific region. Earlier, Dr Ashok Seth had the privilege of being invited to demonstrate complex angioplasty techniques through Live Case transmission from FEHI to AsiaPCR/SingLIVE is 2016. Dr Ashok Seth has been this year invited to perform live case transmission of complex angioplasty cases especially in Bio Resorbable Stents from FEHI to ‘INDIA LIVE’ meeting in New Delhi in March, CSI-NIC meeting in New Delhi in April, ARCH meeting in St. Louis, Missouri (USA) in April. He is also been invited to perform Live Case in Seoul, Korea in April at the Asia Pacific TCT and at Massy Hospital, Paris for the EuroPCR in May. This is the second honour conferred to the senior cardiologist this year. On March 28th, 2017, Dr Seth was given the Dr BC Roy award for the year 2015, in the category of Eminent Medical Person by the President of India. Congratulations. Dr Seth is also listed on Credihealth portal as best Cardiologist. It is moment of pride. Good for having been awarded .Congratulations to Dr Seth . Invasive people should try ,hesitate leading to femoral artery as well as Coronary arteries ruptures as these injuries lead to massive and major surgeries to many patients all across and some times leading to fatalities . Over reaction and enthusiasm may be avoided . Number of such problems leading to fatalities is increasing .